Nigeria, our beautiful and great country made headlines in international media again recently. This time, it was not the reports of the activities of the local terrorist group, Boko Haram, but instead, it was about the presidential pardon for some ex-convicts including those who were jailed for corruption. In the course of discussions on political developments in our respective countries, my foreign friends from Ghana, Brazil, Kenya, Philippines, etc have hitherto expressed their admiration of Nigeria for jailing high-profile corrupt officials, something they said is relatively rare in their own countries. However, a couple of them drew my attention to the widely reported news of the presidential pardon granted to two ex-convicts of stealing from public coffers. It is a development I’m ashamed of, a decision I strongly disagree with and one that should not be repeated. Let me introduce a virus that incapacitates any society it infects. I call it Societal Immunodeficiency Virus (SIV). It has HIV-like effect; it pervades the entire system of the society and makes it sick. Let’s compare a society with the human body; the immune system helps the body to resist infections and keep the body healthy. HIV attacks the immune system, weakens the body’s defense system and makes the carrier vulnerable to all kinds of infectious organisms. If HIV is left untreated or treated wrongly, it progresses to AIDS which is characterized by symptoms and signs of illness from every system of the body. Similarly, the values of a society help it to resist vices or negative acts and keep the society healthy and prosperous. When SIV is left untreated or wrong treatment applied like presently being done in Nigeria, it attacks the value system, weakens the society and makes it vulnerable to atrocious acts. The signs and symptoms include weak health system, poor quality of education, worsening insecurity, lack of potable water, dilapidating infrastructure, high unemployment rate, etc. I call this condition Societal Immunodeficiency Syndrome (SIS). Corruption is the Societal Immunodeficiency Virus I described. Like HIV, SIV is largely preventable but is not curable. HIV rapidly replicates in the body but can be stopped by post-exposure prophylaxis medication if administered within hours of an exposure to the virus; antiretroviral drugs also suppresses the replication. In the case of SIV (corruption), transparency and accountability serves as pre-exposure prophylaxis. Unlike HIV, every society is infected with SIV but the degree of infection differs depending on the strength of suppressants. Fear of God, severe punitive actions prescribed by law and societal stigma serve as good suppressants for SIV/corruption. How has Nigeria faired in applying these suppressants? Corruption in Nigeria is as old as the country’s existence. During my participation in LEAP Africa’s Integrity Institute 6years ago, we were handed copies of pre and post independence news reports of corruption in public offices involving some of our founding fathers. 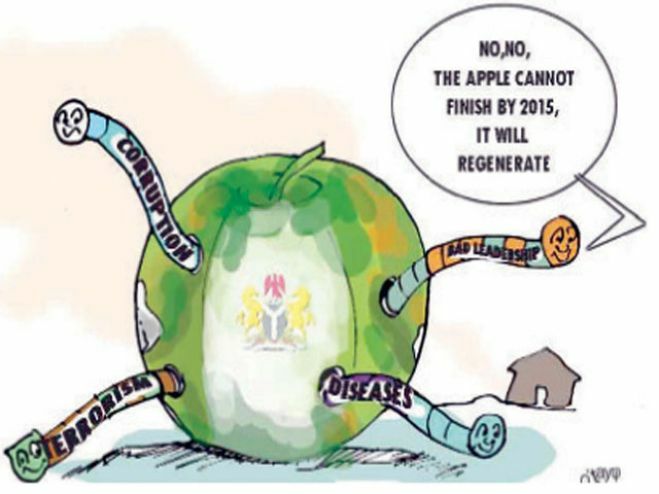 It was a time when the Economic and Financial Crimes Commission (EFCC) was prosecuting lots of high-profile corruption cases; one was hopeful that corruption which has become endemic in Nigeria would be on a downward trend. Unfortunately and regrettably, the opposite appears to be the case today. Let me attempt to answer my earlier question on the application of prophylaxis and suppressants to corruption, beginning with this question, how transparent and accountable is public service in Nigeria? I would argue that there has been an improvement since the return of democracy in 1999; however, relative opacity persists. Business of government at all levels is still largely shrouded in secrecy. Even with the existence of the Freedom of Information law, government agencies still find it difficult to make non-classified information available to Nigerians. Recently, a former Federal Minister and Vice President of World Bank, Dr Oby Ezekwesili asked a legitimate question which demanded to know how the country’s reserves were expended over the last 6years, and the response of the authorities was everything but satisfactory. What about the fear of God? This phrase has probably been re-defined in Nigeria. A “God-fearing” person in Nigeria has become one who goes to church/mosque and makes lots of donations to the religious institution. In many churches today, rich folks with wealth of questionable sources are the ones who occupy the front seats and made elders, deacons, etc. Pentecostal Christian preachers focus their teachings mainly on riches/prosperity with minimal emphasis on good morals and diligence. Someone who slept a poor man and wakes up a millionaire is celebrated in church as a beneficiary of God’s ‘miracle’, that’s ridiculous. Furthermore, does our reward and punishment system deter one from stealing from public coffers? Recent developments in the polity show it does not. I expressed my deep disappointment and displeasure on my facebook timeline over the presidential pardon granted to the former Governor of Bayelsa State, DSP Alamieyeseigha and former Managing Director of Bank of the North, Shettima Bulama. Although the presidency claimed they have shown remorse, their remorse is not obvious to majority of Nigerians. My opinion is that Bulama and Alamieyeseigha deserve the pardon only if they are known to be promoting transparency, accountability and good leadership ideals; teaching others to learn from their mistakes. In this case, they were not. Expectedly, the post elicited interesting debate with folks on either side – supporting or condemning the pardon. Many suggested that we should direct our energy and pressure to the National Assembly to increase the jail term for corruption. I agree absolutely, and have repeatedly canvassed this. It is incomprehensible that our laws provides only 2-year maximum jail term for corruption with an option fine for corruption. I would want the jail term increased to a minimum of 20years with no option of fine. However, this increase will be useless if the president can wake up any day and grant pardon to such convicts before they spend 2years. Who would not want to steal billions and pay fine or simulate sickness, spend few months jail term in hospital, support the president and get pardoned? The words of the present administration are tough on corruption but the actions suggest high tolerance and romance with corruption. The infamous pardon for Bulama and Alamieyeseigha is causing the country an underserved ignominy, embarrassment and ridicule among comity of nations. It has set a very bad precedence that constitutes severe erosion of our lofty values and institutionalization of impunity at the highest level of governance. Although it didn’t come to me as a surprise, I was terribly saddened. I discussed the issue with some friends who are PDP members and public servants and they expressed huge disappointment and frustration. Corruption is ubiquitous but the difference is how culprits are treated. We can learn from other climes, for instance, the immediate past governor of the State of Illinois in United States was impeached and is now serving a 5-year jail term for attempting to sell President Obama’s senatorial seat, this would deter people from making such attempts in future. Sustainable development is not compatible with severe SIV infection or SIS. Every Nigerian must be part of the efforts to stop corruption, and it begins with individuals. The religious institutions should stop practices that are abetting corruption albeit unintentionally. Our traditional values abhor stealing and other forms of criminality and we must stop the rapid erosion of these values. Let’s transfer the stigma held for HIV/AIDS to SIV/SIS. The time to act is now. God bless Nigeria.